This article is based on a Christmas quiz which I originally inflicted on members of Knowle Astronomical Society in December 2004. I chose the first magnitude stars as the theme for that quiz because I believed that the basic facts about these leading luminaries of the firmament (how big, how far away, how hot etc.) would be almost as well known as those (say) for the bodies in our own solar system. As I started to research the subject however, I first became disappointed at the obvious extent of my own ignorance and then surprised at the apparent extent of disagreement between the various sources I consulted. The fact of the matter is that the state of our knowledge about these, the most familiar of the stars, is evolving as rapidly as it is in many other areas of astronomy. For that reason I hope that the article will prove of even more interest than I first envisaged. If anything below is incorrect or becomes out of date (as I am sure it will over time) I would be most grateful if you would let me know. The rest of the article is presented in its original quiz format. Question 1: Which is the brightest of the first magnitude stars? An easy question to start with, although the answer does assume a definition of the term “first magnitude star” which requires some explanation. The magnitude scale was first invented by the Greek astronomer Hipparchus in the second century BC. He simply divided all of the stars in the sky into six categories depending on their apparent brightness. The brightest stars were of the first magnitude, the next brightest of the second magnitude and so on down to the faintest visible stars which were of the sixth magnitude in Hipparchus’ system. This was pretty much all there was to say on the subject for a very long time. The invention of the telescope at the start of the seventeenth century however, made it apparent that there were many millions of stars fainter than the sixth magnitude and by the middle of the nineteenth century, with the subject of astronomy advancing rapidly it was realised that there was a need for a more formal definition of stellar brightness that allowed for a continuous range of possible values, rather than just six discrete numbers. 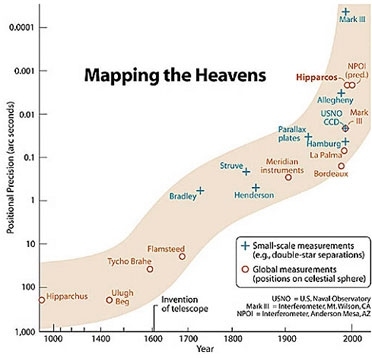 Early photometric measurements established that a first magnitude star is about 100 times as bright (based on measured incident light flux) as a sixth magnitude star and in 1856 Norman Pogson used this fact to adapt Hipparchus’ system to produce the magnitude scale that is still in use today. Pogson’s scale is logarithmic, with every interval of one magnitude equating to a variation in brightness by a factor of just over 2.5 times. Based on this continuous scale, any star with a magnitude of between 5.5 and 6.5 is now considered to be of the sixth magnitude, any star with a magnitude of between 4.5 and 5.5 is considered to be of the fifth magnitude and so on. Under this logic a first magnitude star ought to have a magnitude in the range 0.5 to 1.5. The problem is of course that there are nine stars with magnitude lower than 0.5 and the scale even has to be extended into negative territory to cater for the four brightest. However it would be rather pedantic of me to inform you that Betelgeuse and not Sirius is the brightest of the first magnitude stars. It is customary therefore to extend the definition of a first magnitude star to be any star with a magnitude lower than 0.5. There is one remaining caveat and that is (for a reason that should be obvious): to be considered first magnitude, a star must also be more than 93 million miles away! Question 2: Which is the faintest of the first magnitude stars? Regulus is the faintest of the 21 stars that satisfy the above definition. 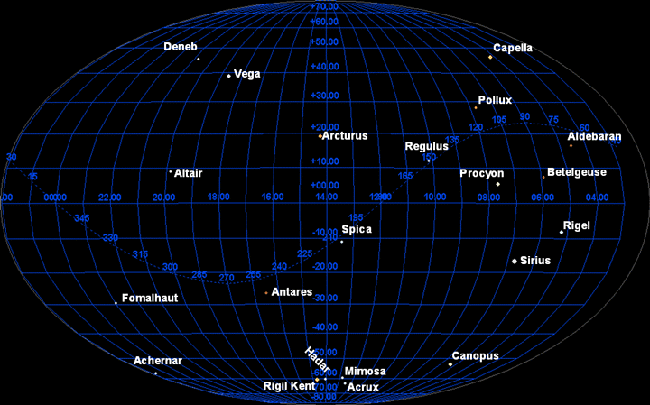 At one stage a 22nd star – Adhara in Canis Major was also thought to be of the first magnitude. The most recent measurements however have moved Adhara’s magnitude back from 1.49 to 1.50, so that it is relegated once more to head the list of second magnitude stars. The constellation of Canis Major therefore has the distinction of possessing both the brightest first and the brightest second magnitude star. Question 3: Which is the closest first magnitude star? The distance to Alpha Centauri was first determined by the Scottish astronomer Thomas Henderson in 1839. He used the only direct technique available for measuring distances in space, namely that of trigonometric parallax. Because of the vast distances of the stars, measurement of stellar parallax had eluded astronomers for many centuries until Friedrich Bessel’s famous breakthrough with 61 Cygni in 1838. Henderson’s measurements on Alpha Centauri were actually made earlier than those of Bessel but he did not manage to reduce his data until some months after Bessel had already gone to print. Question 4: Which is the furthest first magnitude star? Deneb is so far away that its parallax is too small to be obtained by methods currently at our disposal, so 1,600 light years is simply our current best estimate of its distance. Following the pioneering efforts of Bessel, Henderson and others such as Struve in the mid-19th century, Earth based astronomers over the next 150 years only managed to push the parallax method out to about 50 light years with any sort of accuracy. 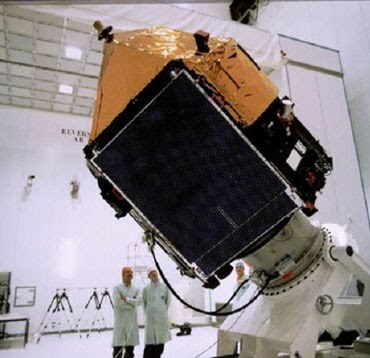 A huge leap forward came in 1989 with the launch of ESA’s “Hipparcos” satellite, whose name honours that great astronomer of antiquity and is an acronym of the somewhat contrived mission title: “High Precision Parallax Collecting Satellite. Hipparcos accurately measured the parallax of over a million stars, 120,000 of them with unprecedented, milliarcsecond accuracy and pushed the limit for the parallax method out to at least 500 light years. ESA images: Hipparcos Satellite and chart showing progress in measuring stellar parallax from the time of Hipparchus (about 150BC) to the time of Hipparcos. Apart from Deneb only three other first magnitude stars were believed prior to Hipparcos to lie at distances greater than this and in each case the Hipparcos measurements led to a substantial change in the estimated distance. Rigel moved in from 900 to 733 light years, Betelgeuse moved in from 520 to 427 light years and Antares moved out from 520 to 604 light years. Question 5: How many constellations have more than one first magnitude star? Only three of the 88 constellations possess as many as two first magnitude stars. All the others have one or none. The three are Orion (with Rigel and Betelgeuse), Centaurus (with Rigil Kentaurus and Hadar) and Crux (with Acrux and Mimosa). As noted above, Canis Major comes close to being a fourth. Question 6: Which pair of first magnitude stars are closest together? The two brightest stars of Crux (the Southern Cross) are just over four degrees apart, fractionally closer together than the next closest pair, Rigil Kentaurus and Hadar (Alpha and Beta Centauri), which themselves lie less than ten degrees away from the Crux pair in the southern sky. Question 7: Are there more first magnitude stars north or south of the celestial equator? The southern skies are therefore marginally better endowed than the northern skies in terms of first magnitude stars. However the fact that the three brightest stars in the sky, Sirius, Canopus and Rigil Kentaurus all lie well south of the celestial equator (with the latter two never visible from the UK), leaves Northern Hemisphere observers feeling they have much the worst of the deal. Question 8: Which are the most northerly and southerly first magnitude stars? The Southern Hemisphere also comes off best in terms of circumpolar stars (i.e. those that never set and therefore can be seen all night, every night). Whereas only Capella, Deneb and Vega are circumpolar from the Midlands of England, five stars are circumpolar from Sydney and Cape Town. These are the Crux and Centaurus pairs and Achernar in Eridanus. From much of New Zealand these five are comfortably above the horizon all of the time and also joined by Canopus. Question 9: Which is the best season for seeing first magnitude stars? The answer to this question is of course more subjective than some of the others, but it’s probably fair to say that a greater number of first magnitude stars are at their most prominent during Winter than at any other time of year. The eight normally regarded as winter stars are the six stars Sirius, Rigel, Aldebaran, Capella, Pollux and Procyon which form a rough hexagon surrounding a seventh, Betelgeuse, together with Canopus to the south. Question 10: Which is the poorest season for seeing first magnitude stars? Again this is a matter of opinion but most observers would probably agree that autumn skies are the most barren in terms of bright stars. Dividing the remaining eleven first magnitude stars between Spring and Summer is likely to provoke more debate, since Arcturus and the two Centaurus stars can be considered borderline. However antipodean astronomers will probably consider the question rather academic since, as already noted, the latter two are for many of them circumpolar. Question 11: How many of the first magnitude stars are variable? For the record, the five other definite variables are: Aldebaran, Antares, Spica, Hadar and Mimosa. Question 12: How many of the first magnitude stars are binary or multiple systems? The systems with the most members are Aldebaran, which is thought to have at least three dwarf companions and Capella which is a close binary orbited by a dwarf star which is itself double. The Acrux system also may have four components, although it is uncertain whether the fourth member is gravitationally bound to the others. Known triple stars in the list include Rigil Kentaurus, whose faintest member, the 11th magnitude red dwarf Proxima Centauri is the closest individual star of all, apart from our own Sun. Proxima Centauri is so distant from its two much brighter companions that it may only be a temporary member of that system. Famous doubles amongst the first magnitude stars include Sirius which has an eighth magnitude white dwarf companion. In the answers to the remaining questions I have ignored those members which do not contribute a significant percentage of the total light output of their system. Question 13: Which first magnitude star has the shortest rotational period? Altair has a rotational velocity of 210 kilometres per second which is about 100 times that of the Sun. The extremely rapid rate at which the Altair is spinning about its axis causes it to bulge at the equator and Altair’s equatorial diameter is thought to be about 14% greater than its polar diameter. Even more extreme is Regulus, with a rotational velocity of about 350 kilometres per second and a bulge of 35%. The fact that Regulus is a larger star than Altair (about 3.5 times the Sun’s diameter compared with 1.5 times for Altair) means that it has a longer rotational period of about 16 hours. Even Regulus is not the most distorted star: Achernar, about 10 times as large as the Sun, rotates with a velocity slightly faster than that of Altair which causes it to distort by a massive 56%. Achernar is shedding significant amounts of material as a result of its rapid rotation, but it is calculated that it would need to be spinning twice as fast in order to disintegrate completely. At the other extreme Aldebaran is thought to have one of the lowest rotational velocities, possibly similar to that of the Sun meaning that with a diameter of over 40 times that of the Sun it may take as long as two years to rotate once about its axis, although there appears to be considerable uncertainty about this. The largest stars probably have rotational periods of many years, but despite this one of them, as we shall see later, is probably even more misshapen than Achernar. Question 14: Which first magnitude star has the greatest proper motion? As might logically be expected the closest star to us is the one that is moving fastest across our line of sight, although it still takes as much as 1,000 years to change its position by as much as one degree, relative to the other stars in the sky. The really interesting question is: which one is second fastest? Plotting the proper motions of the first magnitude stars against their distances in light years, one sees the expected rapid decrease until beyond 100 light years, values are typically below 0.1 arcseconds per year.